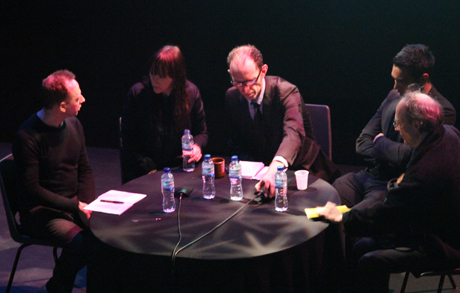 Vicki Bennett, Chris Cutler, Scanner, Blackest Ever Black label head Kiran Sande and The Wire‘s Tony Herrington discuss the impact of digital technology on music making and consumption. In recent years, the internet and a raft of new technologies have transformed the ways in which we produce, perceive and consume music. And as the reality of music’s new digital economy starts to bite, musicians and labels are having to rethink both philosophy and practice, addressing the issue of how they create and disseminate work – while some decry the free movement of music across file sharing networks and the collapse of traditional record industry models, others look to exploit the new possibilities offered by crowd sourcing and social networking.For this panel discussion chaired by The Wire‘s Publisher and Editor-in-Chief Tony Herrington, Vicki Bennett (People Like Us), Chris Cutler (ReR Records), Robin Rimbaud (Scanner) and Kiran Sande (FACT, Blackest Ever Black) discussed possible responses to the challenges posed by music’s changing eco-system. The Wire and Sound And Music‘s Off The Page festival took place 24–26 February at The Playhouse Theatre in Whitstable.